Definition... What is Gastric Torsion? Gastric Torsion or Gastric dilatation-volvulus (GDV) is also known as; bloat, stomach torsion, twisted stomach. It is the second leading killer of dogs after cancer. Death can occur within two hours. The first priority in the treatment of torsion of the stomach must be relief of the distension. * Torsion is an emergency that requires immediate veterinary attention. Bloat usually leads to torsion (twist) but torsion can occur without bloat. The stomach becomes enlarged very quickly and fills up with liquid, gas and/or food. In extreme cases the stomach can rotate on itself, twisting and blocking the entry and exit of the stomach. This is a serious emergency situation and immediate veterinary treatment is essential. Bloat is caused by a build up of too much gas or fluid in the stomach that cannot be expelled naturally. This swelling can be further complicated by an accompanying torsion, or twisting, of the stomach. This gas can extend the stomach causing gastric dilation. If the stomach partially rotates it is called Gastric Torsion. If it fully rotates it is called Gastric Volvolus. Each is a life threatening problem. The bloated stomach obstructs veins in the abdomen, leading to low blood pressure, shock and damage to internal organs. It is a very serious life-threatening condition, which dogs can die of within hours. Understanding the signs, prevention and prompt treatment can reduce the risk of death. Bloat most commonly affects large breed, deep-chested dogs, over the age of two years. By following preventative measures owners can reduce the likelihood of their pet developing this devastating condition. Bloat and gastric torsion are serious conditions, and require veterinary treatment as quickly as possible. The Gastric dilatation is one part of the condition and the volvulus or torsion is the second part in bloat. The stomach fills up with air and puts pressure on the other organs and diaphragm. The pressure on the diaphragm makes it difficult for the dog to breathe. The air filled stomach also compresses large veins in the abdomen, thus preventing blood from returning to the heart. Filled with air, the stomach can easily rotate on itself, thus cutting off its blood supply. Once this rotation (volvulus) occurs and the blood supply is cut off, the stomach begins to die , and the dogs condition begins to rapidly deteriorate. As the stomach swells, it may rotate 90 degrees to 360 degrees, twisting between its fixed attachments at the oesophagus and at the duodenum. The twisting stomach traps air, food and water in the stomach. The bloated stomach obstructs veins in the abdomen, leading to low blood pressure, shock, and damage to internal organs. The combined effect can quickly kill a dog. Not all dogs that have a gas build-up and resultant dilatation develop the more serious life threatening volvulus. However, almost all dogs that have a volvulus develop it as a result of a dilatation. The condition occurs most commonly in domesticated animals, especially dogs and cattle, but rarely in cats. Deep chested breeds are especially at risk. One of the major problems is the spleen, which is attached strongly to the stomach and so moves with the stomach if that organ rotates. This may tear blood vessels, which causes the necrosis of areas of the stomach wall. This leads to peritonitis. In the early days of GDV, it was thought that the spleen was the cause of the stomach twisting and so the spleen was nearly always removed. It was then discovered that the spleen was carried with the stomach, not the propulsive force, and so it is now left whenever possible. Especially since it has been realised that the spleen is an important part of the immune system and not the unnecessary appendage it was previously thought to be. Dogs with bloat are nearly always between four and seven years of age. Usually affects large breed dogs with deep chests. It rarely occurs in small breeds. Dogs who bloat tend to eat large quantities of dry kibble, exercise vigorously before and/or after eating and tend to drink water in large amounts after meals. They may have a history of digestive upsets. There may be a familial association (Inherited). Chances of a recurrence is approximately 15%. The most obvious signs are abdominal distension (swollen stomach) and non-productive vomiting and retching. Other signs include restlessness, abdominal pain, rapid shallow breathing. Profuse salivation can indicate severe pain. If the dog’s condition continues to deteriorate, especially if volvulus has occurred, the dog may go into shock , have a weak pulse, rapid heart rate and eventually collapse. A dog with gastric dilatation without volvulus can show all of these signs, but the more severe signs are likely to occur in dogs with both dilatation and volvulus. Gastric Dilation... excessive salivation and drooling, extreme restlessness, attempts to vomit and defecate, evidence of abdominal pain, abdomen feels hard to the touch. If the dog can burp or vomit, the gut has not twisted. Give your dog Mylanta and walk the dog until the bloat is relieved. Once a dog bloats, it will usually bloat again in the future. Torsion or Volvulus... The initial signs are the same for Gastric Dilation except more severe. The distress is more evident. Rapid breathing, pale gums, maybe collapse. The shock like symptoms are due to the strangulation of the blood supply to the stomach and spleen. Surgery is needed to relieve a torsion or volvulus. Veterinary treatment is of the utmost importance. The diagnostic sign of Gastric Torsion is seen immediately if the dog drinks water when it will vomit stiff white foam like whipped egg white. The only other case of a dog vomiting in this manner is seen when the throat or oesophagus is blocked by a foreign body, in which case is also an emergency. In other conditions the vomit is normal, showing that the stomach is not closed as in Torsion. Standing spread-legged or crouching position or lying down in a curled up position and not wanting to move. Weak pulse and accelerated heart rate. Spleen feels like a hard lump. The spleen is normally wrapped around some of the stomach and therefore splenic torsion usually accompanies gastric torsion, but sometimes occurs without stomach torsion. When either happens, the return of the blood that flows through the spleen is shut off, causing shock, the “immediate” killer. Stress. Any form of stress eg. Change in routine, boarding, new dog in household . Mating. Visit to Vet, etc. (Giving the dog Rescue Remedy helps reduce stress and anxiety). 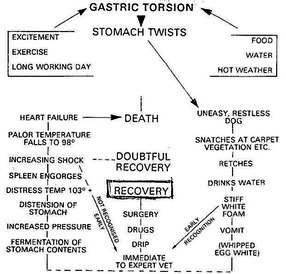 Torsion can occur when the dog has eaten only one or two mouthfuls of food, in which case it is suggested that stress in terms of excitement and anticipation could be the precipitating factors causing abnormal stomach movement culminating in rotation, because in these cases the stomach is not distended initially. On the other hand the stomach may contain a large volume of food and also either air or water : in these circumstances the stomach contents may cause rapid distension of the stomach wall and the increase in tension in the wall may interfere with the normal emptying mechanism of the stomach in terms of muscle relaxation at the pylorus (exit) with the final result that the stomach rotates on its axis. History of aggression toward other dogs or people. Dry food increases thirst and encourages the dog to drink excessively when water is available, a fact of special significance during hot summer weather when the incidence of gastric torsion is known to increase. In the summer, it is advisable to feed in the cooler period of the evening. It is important to cut back on cereal products which are more likely to be associated with fermentation and the more rapid production of gas. Grain should not be the first ingredient in kibble. Beet pulp, added as a filler is another cause of bloat as is Soya. Beet pulp slows down digestion and allows fermentation to take place, and may also cause dietary intolerance. Saponins are contained in common dog food ingredients such as soya beans, beet pulp, alfalfa, peas, beans and oats. When mixed with water and shaken, saponins create a dense foam which traps the gases produced by normal fermentation of the food during digestion. Saponins are also toxins which suppress the vomiting reflex and can paralyse the gastrointestinal tract. Stool hardeners added to commercial foods, such as beet pulp, sodium bentonate, or cellulose flour, could compound the risk of bloat caused by saponins because they slow the passage of food and fibre through the large intestine. Dogs with inflammatory bowel disease may be at an increased risk for bloat. Foods containing an increased amount of added oils or fats increase the risk, due to delayed emptying of the stomach. Fat should not be among the first four ingredients. Eating dry foods that contain citric acid as a preservative. If the meal contains citric acid do not pre-moisten the food. If feeding dry food, select one that includes rendered meat meal with bone product among the first four ingredients. Reduce carbohydrates as much as possible. Whole, unprocessed foods are especially beneficial. Raw meat is recommended. Another known cause is giving calcium supplements to puppies, also rearing puppies on poor quality kibble. Calcium stimulates the production of a hormone called gastrin which has the effect of decreasing gastric emptying and, via a knock-on effect interferes with the tone of the sphincter muscles at either end of the stomach, thereby upsetting proper stomach emptying and belching to release gas build-up. It has been shown that dogs that bloat have too much gastrin present which suggests that excess calcium in the diet increases the risk of bloat. Avoid Brewers yeast, alfalfa and soybean products. Never permit excessive, rapid drinking. Drinking too much water before or after eating dilutes gastric juices. Temperament: dogs that tend to be more nervous, anxious, or fearful appear to be at an increased risk of developing bloat. Insufficient pancreatic enzymes, such as Trypsin ( a pancreatic enzyme present in meat). Dogs with untreated Exocrine Pancreatic Insuffiency (EPI) and /or Small Intestinal Bacterial Overgrowth (SIBO) generally produce more gas and thus are at greater risk. Heredity, especially having a first-degree relative who has bloated. Breed susceptibility : Great Danes, Saint Bernards, Weimaraners, Irish Setters, German Shepherds, Standard Poodles, Boxers, Irish Wolfhounds, Collies, Gordon setters. Multivalent live virus vaccines (mlv) rather than killed vaccines given separately. Feed your dog natural probiotic yogurt, this maintains healthy good bacteria in the digestive tract; this prevents bloat-causing gas from accumulating in the dog’s stomach. The good bacteria in yogurt helps food digest properly. A tablespoon of live-culture yogurt in the food once a day. Add an enzyme product to food. Eg. Prozyme. Promote an acidic environment in the intestine: eg. 1 tablespoon of apple cider vinegar given right after a meal. At the early stages of bloat if the dog can still burp or vomit, give Mylanta. 12 ounces for large dogs.If your dog has a tendency to wolf down food, this increases the chances of developing gastric distress. In this case, feed two meals a day instead of one large meal . It is very important to prevent your dog from exercising and playing for two hours after eating. Especially do not permit him to roll over. Also wait an hour before feeding your dog if he has been playing or exercising hard. Consider switching food to moist or semi-moist instead of dry kibble. Dry meal absorbs much more water in the dogs stomach, and can cause it to swell. Moisten kibble with water for at least 30 minutes before feeding. Try not to feed a kibble which expands greatly when wet. Test the kibble overnight; soak in water and if it has swelled excessively consider changing to another kibble which doesn't swell as much. ALWAYS KEEP a product with simethicone on hand eg. MYLANTA GAS, Gas-X, Infacol (baby colic drops) Phayzme (the most preferred) . If you can reduce or slow the gas, this buys you time to get to the vet if you suspect bloating. Also these products can be given to a dog just before or after stressful situations as a preventative measure. Simethecone works by breaking down the surface tensions of the small air bubbles in the stomach, thus causing bigger bubbles to form , which are easier for the stomach to pass. Simethicone is quite safe, even when administered in large doses. It should be given at the first hint of a gassy stomach, and can prevent the condition getting worse. If your dog burps more than once or shows other signs of gas, give him simethicone immediately. Or a teaspoon of nutmeg, relieves gas symptoms. Fennel, a herb which stimulates good digestion. Helps alleviate acid-stomach, flatulence, food poisoning, motion sickness, gas, nausea and vomiting. Feed your dog in a peaceful and non-threatening environment away from other pets, as very often they wolf down food because they are afraid other pets will steal it. Give your dog chamomile tea...this herb prevents bloat and torsion...one tablespoon a day mixed with food for large dogs. Digestive enzymes can be given as an aid against bloat. Monitor and restrict water intake before and after a meal, especially dry kibble and never let your dog gulp down water, swallowing air. Feed from an elevated height, this helps prevent swallowing air with the food: (this is controversia , as some advice states NOT to use an elevated food bowl). Alternatively another natural position is for them to lie down when eating. Give your dog access to water continuously so there is less chance of drinking a large amount immediately after eating. Placing large stones in your dog’s food bowl can help slow down his eating. Do not feed poor quality kibble; avoid high grain, high carbohydrates. Any changes in the diet should be made gradually, over a period of a week. Avoid foods that are known to cause gas eg. Beans, soy, peas, onions, beet pulp. Feed large pieces of fresh/raw fruits and vegetables 3 to 4 times a week eg. Apples, carrots, oranges. Commercial foods lack enough roughage that a dog needs in order for the stomach to function properly. On dogs known to be highly susceptible to GDV (eg. Ones that have already bloated before) discuss the use of medicinal prevention (such as Metoclopramide Hydrochloride, or Reglan) with your Vet. The medicine is widely used in humans after abdominal surgery to combat painful intestinal flatulence. It chemically decompresses the stomach and intestines, thus forcing the gas out. Like all drugs, there are side effects, so the benefits and problems of long term use should be carefully weighed and discussed with your veterinarian. When gastric pressure is excessive, the vet may reduce it by insertion of a hypodermic needle through the abdominal wall into the stomach behind the rib cage, releasing the pressure very slowly. A LARGE TUBE IS FED DOWN THE DOG’S OESOPHAGUS AND ON INTO THE STOMACH. The hiss of escaping gas can be heard and smelled. If the distension is caused by liquid and/or food, the same tube can pump the stomach providing immediate relief to the dog. After the animal is stabilized, x-rays are taken to help determine whether or not a volvulus is present. If the stomach has flipped or twisted, the blood supply is constricted at each end of the stomach and stomach tissue will die. If the condition is not caught early enough, the dog will go into shock, coma and death. Death from torsion is agonizing. After Decompression of the stomach, the second priority is to treat for shock and stabilise the system as much as possible, before surgery. Shock therapy involves giving a large volume of fluid, steroids and antibiotics and treating the heart. Hypertonic saline solution has shown great promise in treating shock in dogs with GDV. 99% of the time it is shock that kills a dog with GDV, and being able to improve the treatment for shock has made a huge difference in the mortality rates. If the gastric tube is not successful, surgery is the only option, and even with surgery the chances of survival are not that good. Surgery involves pulling the intestines and stomach out and untwisting the stomach. Antibiotics and other antibacterial drugs are placed into the stomach and abdominal cavity to safeguard against infection. If there is any dead tissue the dog will have to be put to sleep. If no dead tissue is found, the vet will suture the stomach to the abdominal wall (Gastropexy), which helps prevent another twist. It has been found that if the stomach is only stitched to the abdomen on one side, in time the attachment stretches and the stomach can twist again, so it is recommended to stitch the stomach on both sides. If gastropexy is not performed 80% of dogs will develop GDV again. There is a 5% chance of recurrence following gastropexy. Most of the recurrences are simple dilation (bloat without torsion), and respond well to decompression (stomach tube). However, a full blown recurrence of GDV may cause or follow the breakdown of the gastropexy. Therefore, medical and dietary management after GDV is important to help prevent recurrence. In addition to gastropexy, some vets perform pyloroplasty to help prevent recurrence of GDV. Pyloroplasty is an operation in which the pylorus (the outlet from the stomach) is widened to ensure the free passage of food into the intestine. In clinical studies, researchers reported a much higher number of complications, during the first week after surgery, in dogs that underwent this procedure as compared to dogs that underwent gastropexy alone. It is important to understand that if a dog is not treated quickly following the onset of torsion, the changes associated with distension of the stomach wall leading to gangrene and the severe shock may become irreversible. In this case the dog may die from heart failure shortly after surgery, or as a result of peritonitis, due to severe damage of the stomach wall, when death occurs two or three days after surgery. Aftercare includes high doses of antibiotics and drugs to promote normal gastric motility. Solid food should not be given too soon ,to allow the wall of the stomach to heal. Natural live yogurt is very beneficial to restore safe bacteria to the intestinal tract. After recovery, feed frequent small meals with a minimum of cereal content, fed under supervision. Cardiac arrhythmia (irregular heartbeat) is common following an acute episode of GDV. Heartbeat should be monitored during the first week post surgery. Anti-arrhythmic drugs may be necessary. Gastric necrosis (cell death) and perforation can occur up to a week after surgery, especially if resection (surgical removal of part or all of a diseased organ) was performed. Stomach fluids must be closely monitored during surgery and during the first five days after surgery. If gastric necrosis and perforation occurs, euthanasia should be seriously considered. Food and water is withheld for the first 48 to 72 hours after gastropexy, (bloat surgery), then multiple small meals are fed. Once the dog returns home, he/she should be fed small portions of bland food frequently and should not be exercised within 2 hours after meals. Veterinary attention should be sought immediately if there are signs of recurrence. 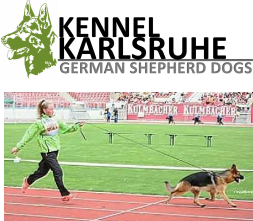 Some researchers believe that many dogs which get GDV die not from the initial shock and blood-flow stoppage, but from reperfusion injury. This is the term for chemical damage that occurs in a tissue when oxygen-rich blood returns to tissues that have been temporarily deprived of a blood supply, as in a dog being treated for bloat/gastric torsion. When the dog’s blood flow is re-established and the oxygen-rich blood returns to the blood-starved tissues, poisons known as toxic oxygen radicals are released, resulting in reperfusion injury.